What's the first thing you see when you walk into a home? Well, that depends entirely on how good the lighting is. Although lighting isn't at the forefront of everyone's minds, it can play a major role in the presentation of your home. It's not just about brightness, either – depending on the location inside your home, the type and style of bulb you choose will determine its usefulness. Do you have stainless steel appliances in the kitchen? Bright, overhead lights will make them shine like the masterpieces they are. Want to create a relaxed ambience in your bathroom or media room? Warm, dimmable lights will give you the mood and versatility you're looking for. The examples go on and on. To help you find the perfect lighting for each part of your home, we're going to discuss each type of light, what they're capable of (and not capable of), and where each is best suited. Thomas Edison first invented the incandescent light bulb in 1879. While this was the standard for light for many years, the energy consumption of incandescent light has phased these bulbs out in favor of more energy-efficient options. Halogen incandescents are the new and improved version of Mr. Edison’s original creation. With 25% better energy efficiency, these bulbs last around 1,000 hours and are known for their warmer coloring (they range from orange to yellowish white in appearance). They provide instant light when you turn them on, and they are fully capable of being used with dimmers. Fluorescent lighting was the innovation that came after traditional incandescent, using gas to create light. Compact fluorescent lamps (CFLs) are the most current iteration. These bulbs offer 70-75% energy savings, they last significantly longer (around 10,000 hours), and they’re known for their cooler lighting (ranging from bright white to a cool blueish purple tint). However, they do take a few minutes to warm up and reach full brightness after turning them on, and not all are dimmable (using fluorescents with dimmers usually creates unpredictable flickering due to its gassy nature). You've probably heard by now that LEDs are the way of the future in the lighting business. This is true, and for good reason. On top of being 80% more energy efficient, LEDs have the longest lifespan, averaging around 25,000 hours per bulb, and they have the widest range of available coloring (you can get them in a warm orange all the way to a bright blue). Like incandescents, they provide instant light when switched on, and they can be used with dimmers and several other types of controls. Because of their many benefits, LEDs have become the go-to solution for nearly all lighting needs – both residential and commercial. Incandescents and fluorescents used to have their ideal places in the house, but the truth is, LED technology offers so much these days that there’s really no reason to use the other types anymore. Regardless of which bulb you decide to go with, choosing proper lighting for each part of your home still means discussing coloring and functionality. As mentioned earlier, different parts of the home demand different properties for ideal presentation and usage. Before discussing each specific part of the home, it’s important to first explain color temperature. When shopping for lighting, you’ll come across a detail called “color temperature.” This rating is what describes the actual shade of light that the bulb will produce. The scale ranges from 0-10000K, with most falling between 2000K and 7000K. To put it simply, 5000K is right about “true bright white.” The further down the scale you go, the more yellow-orange the light will be; the further up you go, the bluer the light will be. See an example here. Common rooms like living rooms, dining rooms, or TV rooms often look best in a warmer light (around 2000-4000K) with an accompanying dim control so you can adjust the brightness level based on the setting. Going slightly brighter towards a truer white (4000-5000K) can also be great for modern homes because it gives off a sharper image. The kitchen is an area that should always command a true, bright white (5000-6000K) so that you can see what you’re doing while cooking. On top of that, if you have things like stainless steel appliances or marble countertops, bright white lighting provides a sparkling, awe-inspiring image. Most people prefer a calm, relaxed setting while visiting the restroom. For this, a warmer yellow-orange light (2000-4000K) is most suitable. However, like with common rooms, a bright white can give off a more modern look depending on your interior design – just make sure you include a dimmer so guests can adjust the lighting to their preference. The garage is another area where you’ll want a crisp, clear image, especially if you’re the handy type who loves a good DIY project. A true white light (5000-6000K) or even a slightly blue-white light (7000K) would provide the most ideal lighting in the garage because it will allow you to see the things you’re working on with perfect clarity while eliminating any unwanted shadows. Outdoor lighting, like walkway lights, porch lights, and backyard lights, really vary from person to person and house to house. There’s not necessarily one type that looks most proper on all. To figure out which looks best on your yard, either experiment with different types if your time and budget allows, or look around online for examples to see if you can find one you prefer. Now that you know how the color temperature scale works, you should be able to spot lighting shades easily just by looking at an image. There are many metrics to look at when comparing lighting options: energy consumption, lifespan, lumens, color temperature, and more. 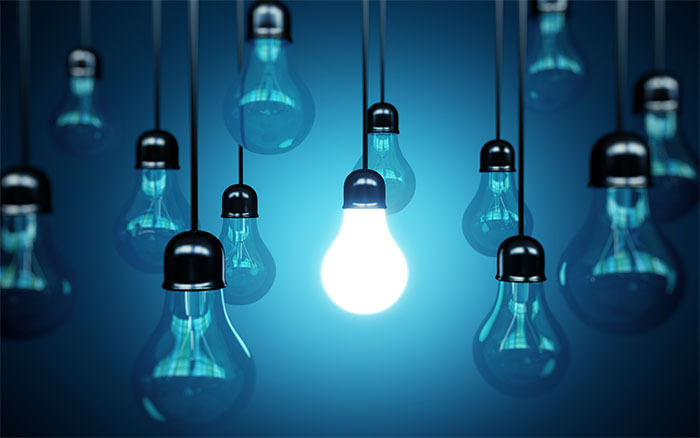 To simplify the decision-making process and improve the overall appearance of your home, takeaway these key points: 1) LED is the best type of lighting no matter what the circumstance, and 2) aim for bulbs with warmer light (lower color temperature rating) for common rooms and bathrooms, and brighter light (higher color temperature rating) for kitchens and garages. Cory Yeakel is a full-time writer and home improvement lover. When he’s not writing or working on his latest DIY project, you can find him in the kitchen working on new recipes for breakfast, lunch, and dinner.